Hello and Happy Hump Day! It's finally Fall y'all! Well at least it is finally feeling fallish! lol As usual on Wednesday I'm over with the Paper Craft Crew. 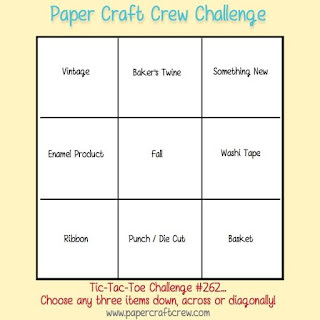 This week's Challenge is a Tic-Tac-Toe that has so many options depending on which way you go.. I went straight down the middle with Baker's Twine, Fall and Punch or Die Cut. I stamped the leaves onto Bristol Smooth Cardstock with Versamark and then heat embossed them in White. I used my Tim Holtz Distress Inks and an Aqua Painter to color them in. The inks used to color the leaves were Spiced Marmalade, Fired Brick, Peeled Paint, and Mustard Seed. Once painted I used my heat tool to dry them and then sponged some Antique Linen Distress Ink around them going a little darker around the edges. Avery Elle Wonky Rectangles were used to cut out the front panel. I stapled a bit of scrap ribbon in the upper left corner. For the Leaf over the ribbon I used a small piece of Bristol Smooth with the same ink colors blended in to cut the Lawn Fawn Fall Tiny Tag. After I die cut the tag I used my Ink Blending tool to add more of the Spiced Marmalade Distress Ink around the edge of it. Some Natural Baker's Twine was run through the tag and then tied in a bow. I twirled the end of the twine with the edge of my scissors and then attached the leaf with foam squares. I used some Ranger Matt Medium to attach the "thanks" wooden element to the front of the card. The panel was matted onto a piece (retired) Mossy Meadow Cardstock and then adhered to a 110# Neenah Classic Solar White Cardstock A2 Cardbase.